Stinson's first light plane, the model 105, is also known by the designation HW-75 and HW-80, received its Approved Type Certificate number (ATC#) 709 on May 20, 1939. A Continental A-75-3 engine powered the 1939 model 105 (HW-75) while the 1940 model 105 (HW-80) was powered by the Continental A-80-6 engine. (some versions were powered with a 90 h.p. Franklin) Gross weight is 1580 pounds. While listed as a 3 seater the useful load of only 655 pounds makes carrying three people most difficult. A cruise speed of 105 mph was the reason for the model number. One major innovation of the model 105 is the use of wing slots for better slow speed control. Wing slots would be a design feature of all future Stinson aircraft. About 535 model 105's were built, with several purchased by celebrities including Jimmy Stewart and Edgar Bergen. 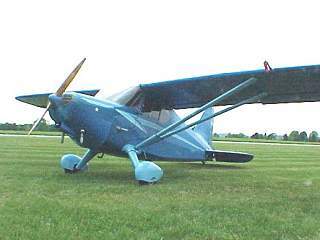 Stinson aircraft, named after Eddie Stinson, at the time of the 105 design, 1939, was part of Aviation Manufacturing Corporation. Headquarters and plant were at Wayne, Michigan. Vultee Aircraft Corporation purchased the Stinson Division in 1940 and moved headquarters to Downey, California. At the same time manufacturing was moved to Nashville, Tenn. The first production batch of the 1940 model 105's was built in Nashville, Tenn. Military orders overtaxed that facility and production of the 105 returned to Wayne, Michigan. The Stinson 105 was a popular three place light airplane and was considered as one of the "big four"in the light plane field.It was available as a land plane or sea plane, with two side-by-side seats forward and one facing sideways behind them. Powered with a 90 h.p. Franklin engine, the 105 has a maximum speed of 115 m.p.h.,cruises at 105 mph, Its normal range is 380 miles. Rate of climb 507 ft./min. Service ceiling 13,000 ft. Manufactured by Stinson Aircraft Division Manufacturing Corporation, Wayne,Michigan.